Our man in NYC, “Scoop B” Brandon Robinson, hit us with this feature on New York’s most mysterious basketball could-have-been and the documentary that detailed his attempted rise from high school stardom to the NBA. Originally published in late 2013, when “Lenny Cooke” was first screened in theaters, the film is getting new life as a Video On Demand release that will be available on iTunes, Google Play, Amazon and more on June 7th. At one time, Lenny Cooke was a man among young boys on the courts where the future of basketball was being formed. That time was 2001. 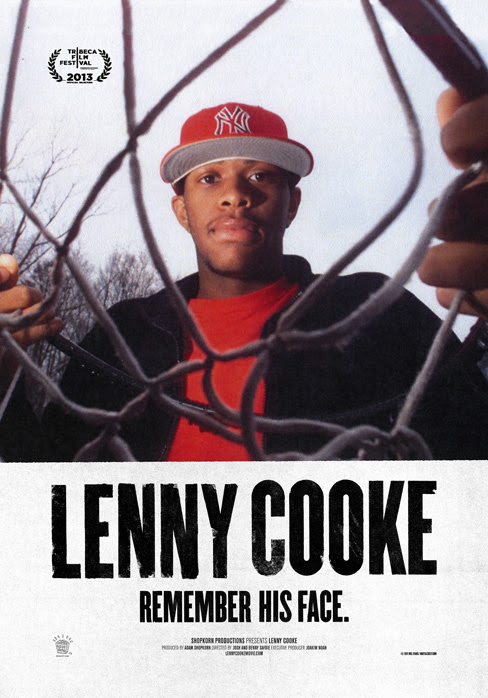 In 2001, Lenny Cooke was considered the top high school basketball player in America. As a high schooler, the Brooklyn native was ranked higher than those who would come to define the NBA in the following 10 years — LeBron James, Carmelo Anthony and Amar’e Stoudemire among them. But for Lenny, his last 10 years have been more of a search for redemption and a true meaning of life done so far away from the Showtime lights of the Association. Last week, the world was finally given the opportunity to catch up with Lenny Cooke as a self-titled documentary chronicling his life debuted at Lincoln Center in Manhattan. It may already be an era that’s starting to fade, but for one several-year stretch going straight from high school to the pros was close to the norm in regards to the brightest basketball prospects — many who did not do it were seen as fools for not doing so, regardless of if they truly possessed the right skills or not. Unlike many that didn’t have the skills, Cooke seemed primed and ready to make a splash in the NBA before he received a high school diploma. Starting at that heady time in his life, the documentary — directed by brothers Josh and Benjamin Safdie — goes back in time starting in ’01 and chronicles the life of a guy who had it all laid out for him at an early age: fame, money, free gear of all sorts, limos and surrounded among celebrities and their hangers-on. “The biggest thing is we wanted to tell his story chronologically and from his perspective,” Benjamin Safdie told Regal Radio of Cooke. All-star center Joakim Noah of the Chicago Bulls’ was an executive producer of the movie. Noah knew Cooke going back to those early days when he was relatively new to the prep basketball scene in New York and Cooke stood as a large influence. After his sophomore year of high school, Cooke’s family moved from Brooklyn to Virginia but Lenny didn’t want to leave the borough, as a compromise he moved to Old Tappan, New Jersey and in the home of a woman named Debbie who would be his well-lucrative care taker for the next couple years. While in Old Tappan, Cooke played basketball at Northern Valley High School and averaged 25 points, 10 rebounds, two steals and two blocks per game in his junior year, establishing himself as the can’t miss prospect of his graduating class, with correspondence from every college in America flooding his doorstep. The documentary effectively turns at a time when Cooke’s real life made a turn and that’s when he went head-to-head with a then-unknown LeBron James, who then was coming out of a successful sophomore season at Akron, Ohio’s St. Vincent-St. Mary’s High School. The stage was the Adidas ABCD Basketball Camp in the summer of 2001. Cooke was the life of the party at the camp, he was silly and fun but he was unmistakably talented. “He just enjoyed life, from my perspective,” said former Seton Hall University guard Jamar Nutter, who played at ABCD Camp with Cooke. Matched up in their battle, James hit a last second shot over Cooke at the buzzer to propel his team to a win at the Camp and in doing so propelled his name into the top echelon of basketball prospects while taking some shine off the previous young Prince of Brooklyn. Months later, James would appear on the front cover of Sports Illustrated magazine with the title “The Chosen One” above him and Cooke started a stretch of inactivity that began his long decent. Soon after the camp, Cooke — a 19-year-old senior — was deemed academically ineligible to play high school basketball in New Jersey, whose rules mandate that student-athletes do not play past the age of 18. Cooke didn’t play basketball as a senior in high school and didn’t have the grades to accept a Division 1 scholarship to play on that level. After graduating high school, Cooke declared for the 2002 NBA Draft, believing in the opinion of agents who said he was a sure lottery pick. Cooke ultimately went undrafted. Despite the fact that Cooke didn’t make it to the highest levels of ball, he’s never been in trouble with the law or provided himself any other obstacles that tragically hinder players in their development. Arguably, Cooke didn’t make it because the game too easy to him and it didn’t hold his interest like it did others who were obsessed by it. “I’ve never been in trouble, been on drugs or nothing like that,” Cooke says. He thinks that his partying and hanging out at all hours of the night were reasons why NBA executives didn’t want to take a chance on him. After going undrafted, Cooke bounced around semi-pro basketball leagues in the United States and abroad, looking to continue his NBA dream. It never became a reality, but Cooke says he has no regrets. “At the time I was young and immature,” Cooke said. The movie also gives an inside look in the special relationship that he had with Anthony, who at one time also looked up to Cooke on the East Coast AAU scene. Lenny Cooke (L), who was ranked the No. 1 high school basketball player in the U.S. in 2000, poses with Joakim Noah of the Chicago Bulls, who is also the executive producer of the movie “Lenny Cooke,” at the film’s premiere at the Gene Siskel Film Center in Chicago in December 2013. “Some of the advice I gave, I wish I would have took,” said Cooke. Noah is glad the story is being told. “It is easy to tell stories about your success, but extremely courageous to do the same with your failures,” Noah said. At a recent screening of Lenny Cooke in Manhattan, co-director Josh Safdie said Lenny is still a redeeming figure. In 2005, a clause in the NBA’s collective bargaining agreement disallowed players to declare for the NBA draft right after graduating high school, players now have to be at least a year removed from that graduation. Years removed from his playing days — when making the jump from high school was allowed — Cooke agrees with the the way things stand now. For more information on the film check out its website. ← Pro Wrestling: Time to Shake Things Up With Extreme Rules?